He made his debut with 'Aashiqui 2' with a small role. He followed it up with small parts in a couple of other films. 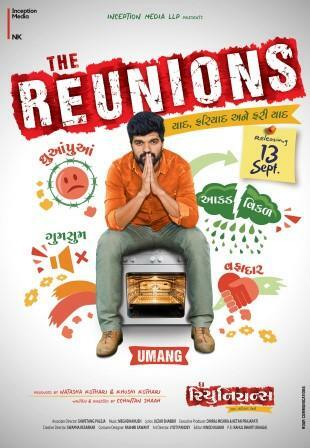 Deep Dholakia's perseverance and patience of seven years has finally resulted him in bagging a lead role in the upcoming Gujarati film 'The Reunions'. In this interview the actor, with a striking personality, talks about his new film, journey as an actor, views on regional cinema and what the future holds for him. I had no connection in the film industry. I was born and brought up in Ahmedabad. My father is a yoga acharya. My love for acting started with doing school plays. After doing a course with Anupam Kher's Actor Prepares institute in Ahmedabad, I came to Mumbai in 2011. I have done five Hindi feature films. They were all small roles but I enjoyed being a part of those films. 'Aashiqui 2' was my first film in which I played the role of a bartender. One of my films got premiered in Cannes International Film Festival in 2015. The film is yet to release in theatres. Being a Gujarati, why did you not think of a Gujarati film earlier? I have done a Gujarati film which did not shape up very well. I came to Mumbai at a time when Gujarati cinema was not as huge as it is now. There is a certain growth today because of which a lot of people are getting attracted to it but that was not the case back then. Things started changing from 2011. Before that, only a certain type of cinema was being made. I wanted to get into Hindi films but was open to doing Gujarati cinema as well. The problem was that I did not any get any good offers from there. I am glad I came across a beautiful script like 'The Reunions'. You can never predict the fate of a film but I am sure after watching the film, the audience will definitely say that the film is a very polished product and you cannot find any technical faults in it. Tell us something about your role in 'The Reunions'. There is a huge difference between college life and the kind of things you have to face after getting out of it. I play the role of a young man who is ambitious and a big dreamer when he is in college but after graduating from college, reality hits him and he had to sacrifice his dreams for some reason. I am sure a lot of people who watch the film will relate to my character. A Gujarati film like 'Wrong Side Raju' was produced by a Bollywood production house like Phantom Films. Do you think from producers from Bollywood will be interested to invest Gujarati films in the future? I am sure the interest in regional cinema will grow with time. The Gujarati Film Industry is growing rapidly. Because of Netflix and other streaming services, the world is getting smaller. All the content that is being made across the world is available in your phone. In the 80s and 90s, people did not have much of an exposure to world cinema. Now, they can get all the content in the world at the click of a button. In such a scenario, you cannot afford to make films that are low on content. If a film is bad, people will stay away from the theaters and prefer watching something on their phones. I am working on a couple of projects but I cannot reveal much about them right now. I am also in talks for two Gujarati films and a Hindi film.